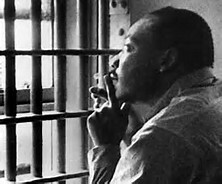 Those were Dr. Martin Luther King Jr.’s words, when he wrote to eight powerful clergymen inside a prison cell in Birmingham, Alabama. And most often than not, you do come across cases in law school where there are “unjust” laws–not because of class/race/gender discrimination but because Congress (or in this matter the Supreme Court of the United States) have failed to articulate clearly, what is a “just” law and what is an “unjust” law. One of the few things that you learn in law school is that courtroom judges cannot pass judgment on laws because the laws themselves are too vague or confusing. Their only duty is to interpret the language of the law that “Congress themselves have interpreted as.” And as a result, judges have remanded cases (taking them back to lower courts to have them tried again) or direct them to a jury where they decide its interpretation. In this same fashion, it is why unjust laws like Jim Crow still exists in America because of Congress’ and US Supreme Court Justices’ failure to articulate correctly on what is an “unjust” and “just” law. It was two years ago that I wrote a political editorial on this topic called “The Federal Fight for ‘Just’ and ‘Unjust’ Laws,” which I swayed public opinion on why voting down a “just” law, the Voting Rights Act of 1965, was an unjust cause. However, it was still not enough to prevent more than five justices on the United States Supreme Court from striking down this “just” law. It is politics, or what I would like to call realpolitik, that get in the way of moral character. It is more important for public officials to save face than to enact or uphold a “just” law. As we commemorate the 50th anniversary of Bloody Sunday, and remember those who gave up their lives so that people of color can have their right to vote, the fight for “just” laws is still not over. Be active in town hall meetings, educate yourself on political issues, and enact change through the ballot and/or run for public office–protesting and marching is not enough. Let your voice be heard! While everyone has their own opinion on Race in America, I found that news to be a little sad. Thank you Representative John Lewis for your continual years of enacting, fighting, and upholding “just” laws in America. Must have figured out Bloody Sunday tag already taken.